Today is Rd 1-17. My rash seems to remain in good control so long as I continue to put an emollient lotion on it. The only other side effect I seem to have is fatigue, and as long as I do get a chance rest each day, I seem to cope just fine. Kathleen and I just finished two days up on Hutchinson Island, near Stuart, FL. 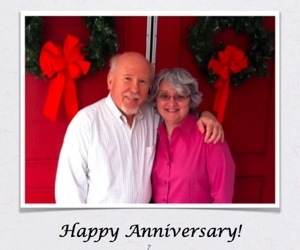 We celebrated our 35th wedding anniversary! We stayed at a resort on the island. One of the sights we went to see is the Gilbert’s Bar Relief Center. This one of about 10 that were established in the late 19th century as a way to provide food, clothing and rest for persons shipwrecked off the Florida coast. 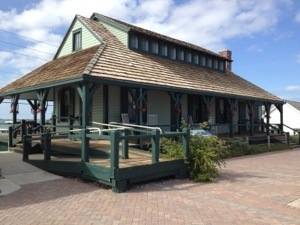 It is one of the oldest houses in Florida. Below is a photo taken by Nancy on Sunday after church at St. Andrews. At this point, I’d say my symptoms of peripheral neuropathy are now about 5% of their maximum in September-October. Thank you, Ruth. Good luck in your new position. Keep me posted on how you’re doing.